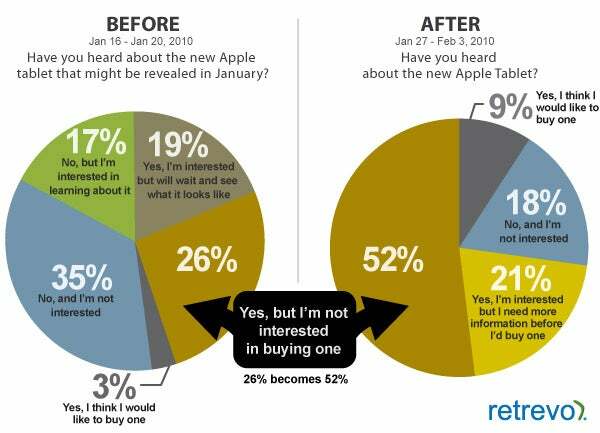 Now that everyone's up to speed on Apple's iPad, few people actually plan to buy one, according to a survey by Retrevo. On two occasions, Retrevo asked 1,000 of its electronics marketplace users whether they will buy or are interested in the iPad. 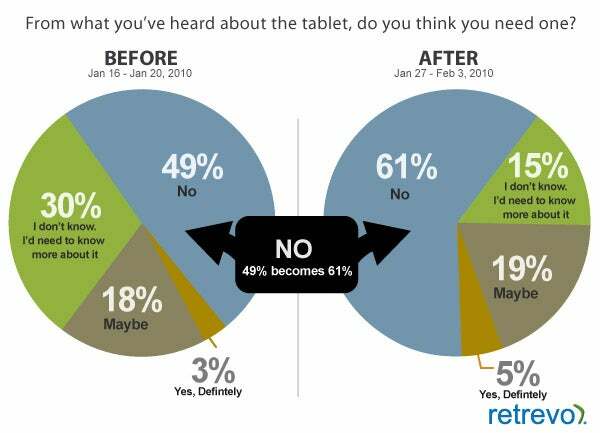 Before Apple introduced the iPad, 26 percent of respondents said they'd heard of it, but weren't interested. That number doubled to 52 percent after the iPad event. This implies that observers weren't swayed by what they saw. “Whether this device becomes a big hit is anyone’s guess but based on this study it sure looks doubtful,” Retrevo's report says. The reality might not be so damning. First, keep in mind that 9 percent of respondents said they definitely plan to buy an iPad now, compared with just 3 percent before the event. Also, consider that the number of fence-sitters is slightly higher now, with 21 percent saying they want more information, compared with 19 percent who previously said they'd wait and see what the iPad looks like. Here's where it gets tricky: If you add up the percentage of people who don't care about the iPad, regardless of whether they'd heard of it, there's only a 10 percent increase from before to after the event. It's conceivable that most people now in the “heard of it, not interested” camp were uninterested even before they knew about the iPad, so you can't assume that Apple's event killed interest in the product. And don't forget, the number of people who plan to buy an iPad increased by 6 percent. Sorry to say it, but the real takeaway here is tame and predictable. 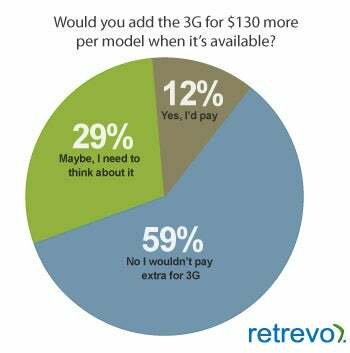 From the get-go, most people in Retrevo's survey were not interested in the iPad. Of the roughly 40 percent who wanted to know more, some decided the product was not for them, and a slightly smaller percentage have decided to buy one. There are still plenty of folks who haven't made a decision. For an entirely new category of tech products, all of this seems pretty normal.